(Nanowerk News) Research conducted at the University of Michigan College of Engineering may lead to the use of insects to monitor hazardous situations before sending in humans. Professor Khalil Najafi, the chair of electrical and computer engineering, and doctoral student Erkan Aktakka are finding ways to harvest energy from insects, and take the utility of the miniature cyborgs to the next level. "Through energy scavenging, we could potentially power cameras, microphones and other sensors and communications equipment that an insect could carry aboard a tiny backpack," Najafi said. "We could then send these 'bugged' bugs into dangerous or enclosed environments where we would not want humans to go." The principal idea is to harvest the insect's biological energy from either its body heat or movements. The device converts the kinetic energy from wing movements of the insect into electricity, thus prolonging the battery life. The battery can be used to power small sensors implanted on the insect (such as a small camera, a microphone or a gas sensor) in order to gather vital information from hazardous environments. A spiral piezoelectric generator was designed to maximize the power output by employing a compliant structure in a limited area. The technology developed to fabricate this prototype includes a process to machine high-aspect ratio devices from bulk piezoelectric substrates with minimum damage to the material using a femtosecond laser. 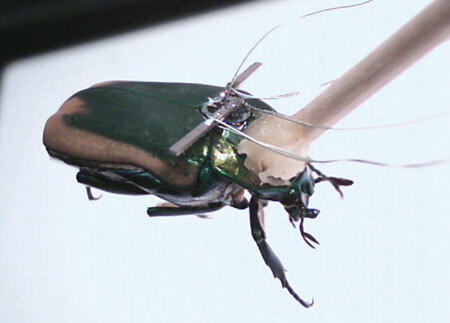 In a paper called "Energy scavenging from insect flight", the team describes several techniques to scavenge energy from wing motion and presents data on measured power from beetles. This research was funded by the Hybrid Insect Micro Electromechanical Systems program of the Defense Advanced Research Projects Agency under grant No. N66001-07-1-2006. The facilities used for this research include U-M's Lurie Nanofabrication Facility.